If you're in a rush, here is our quick list of the best Varidesk alternatives on Amazon. We provide more details about why we like each model lower on this page. Why Choose a Varidesk Competitor Rather Than Buying a Varidesk? Price - all of these options, even electric converters, are less expensive than the Varidesk brand's desktop sit-stand converter). 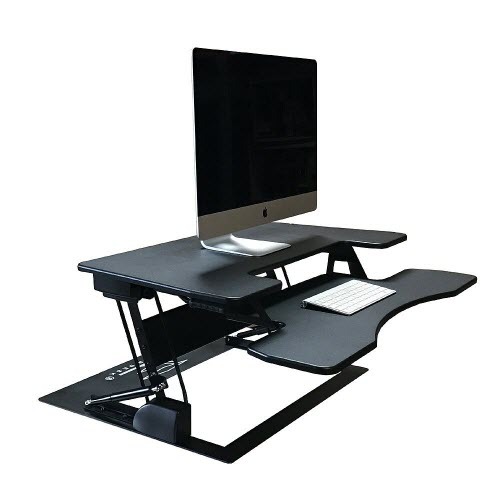 Ergonomics - the primary reason most people buy a standing desk or standing desk converter is to improve their health and ergonomics in the workplace. Many people complain that the Varidesk doesn't adequately address this concern. Stability - the design of the Varidesk isn't perfect. In fact it is not as stable as FlexiSpot's M2 line of desktop converters. I'll tell you why. In addition to evaluating these desks like Varidesk on these terms, our most important selection criteria in choosing these 5 alternatives to VariDesk was quality. Any time there is innovation in an industry, it is followed by cheap alternatives and knock-offs which sacrifice quality to attract budget-conscious buyers. These 5 competitors to Varidesk all come in cheaper without sacrificing much quality. In some cases, these manufacturers have produced a better sit-to-stand desktop converter. You can read my full review of the FlexiSpot M2B, but after testing this desk converter for 100 hours I feel confident that it is as good or better than the Varidesk and it's my top recommended Varidesk alternative. It will typically run more than $150 less than the Varidesk Pro Plus 36, it offers an additional height adjustment and a higher max-height. I also found it to be more stable. 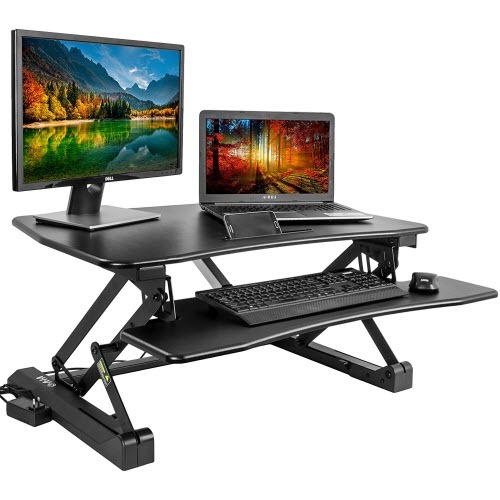 I've compared the VIVO Converter to VARIDESK in another article on this blog, and I like the electric version better and consider it a serious upgrade over Varidesk for most users (especially those who have a back issue and are looking for a desktop riser to help with that). 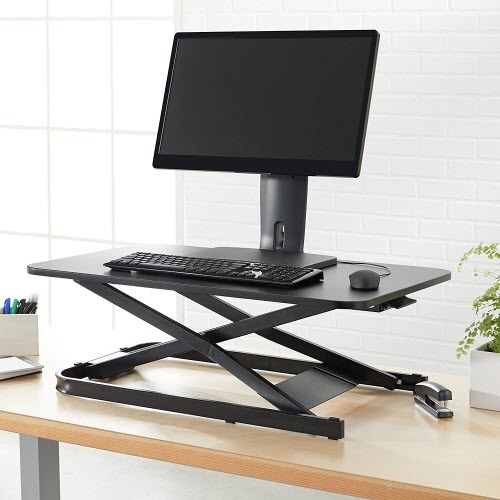 Even though this is an electric sit-to-stand desktop converter it's still less expensive than the Varidesk Pro Plus 36, and I think it's a great option. I love the fact that there's a USB plug on the side for your mouse or phone charger -- a nice touch. 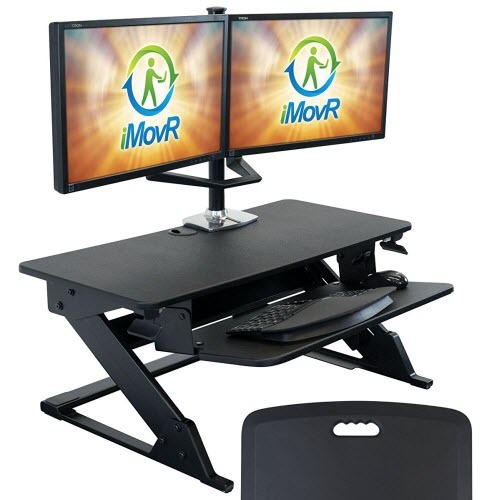 I'm a huge fan of using a negative tilt keyboard tray to avoid carpal tunnel and other conditions which can come from improper ergonomics, and the ZipLift+ standing desk converter from iMovR is the best converter on the market if maintaining an ideal ergonomic angle for your hands and wrists is important to you. The adjustable keyboard tray (which allows for negative tilt) is a game changer and is much better than what you can get with a more-expensive Varidesk. If you are looking for a cheap Varidesk alternative, choose the Fancierstudio Riser Desk. It's sturdy, well-made, and will do just about everything a Varidesk will for less than half the cost. The large, full-width keyboard tray is a great size on this one too. It's the best cheap competitor to Varidesk. This lightweight and budget-friendly Varidesk is manufactured by a brand you probably recognize ... Amazon. It's not the best quality product on our list but I liked that it has a small footprint, is lightweight and easy to move (if that's something you're looking for in your office), and it comes with a 1 year warranty from Amazon. It's definitely not as sturdy as the FlexiSpot, but if you are in the market for a cheap Varidesk competitor then this one from AmazonBasics is a good option. Should You Buy a Varidesk Alternative? The Varidesk Pro Plus 36 is a quality product, and it's one I like a lot, but if you're looking to save some money, you'll probably be happy with any of the 5 Varidesk competitors listed on this page. The question of whether or not you should buy an alternative to the Varidesk is a personal one. If you're looking for longevity and performance, standing desk converters like the AmazonBasics model may disappoint you. 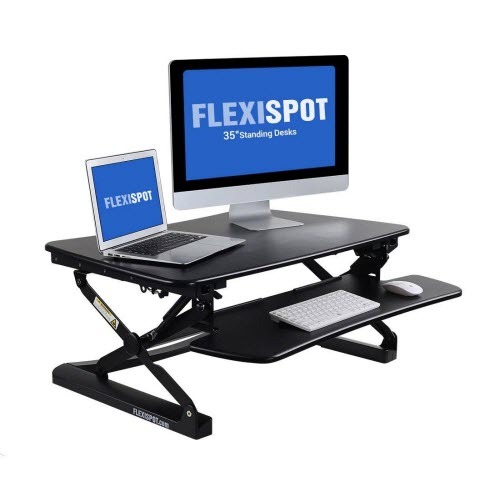 The FlexiSpot will not, and if you are looking for the closest thing to a Varidesk that will cost less money, that's the model I would recommend.